The first step to build a first class CTI plugin is to get a test environment where you can try out functions of the new java api without the complexity of the whole Notes client plugin system. First of all, download the UCI Java API from the starface website and expand it to a folder on your harddisk. 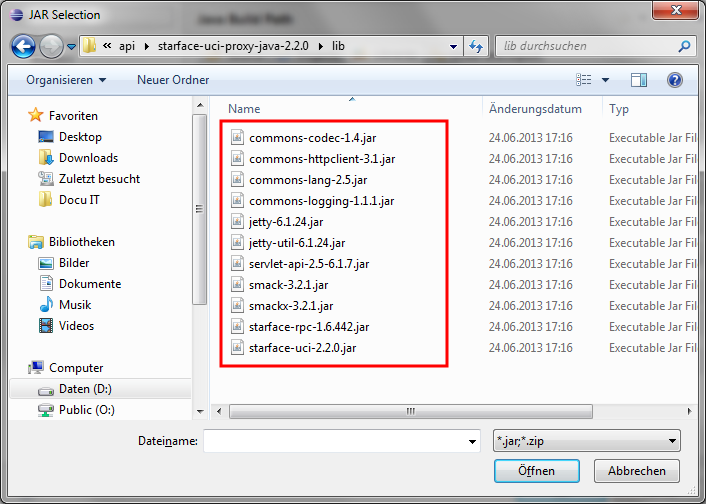 Unfortunatly the log4j.jar is missing in the UCI Java API download. 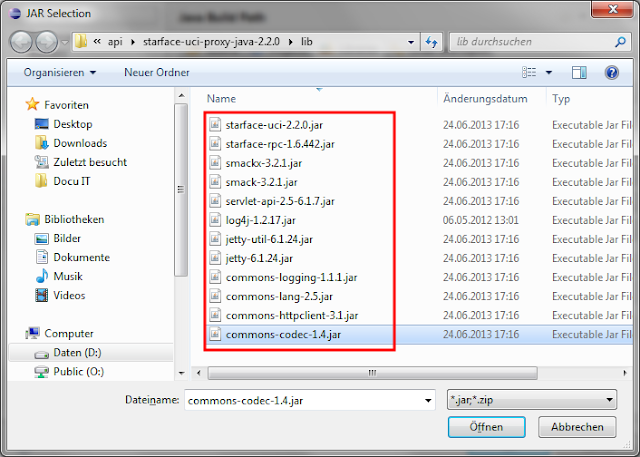 So you have to download the log4j.jar from http://www.apache.org/dyn/closer.cgi/logging/log4j/1.2.17/log4j-1.2.17.zip and copy the log4j.jar from this zip to the "starface-uci-proxy-java-2.2.0\lib" folder in the UCI Java API folder. 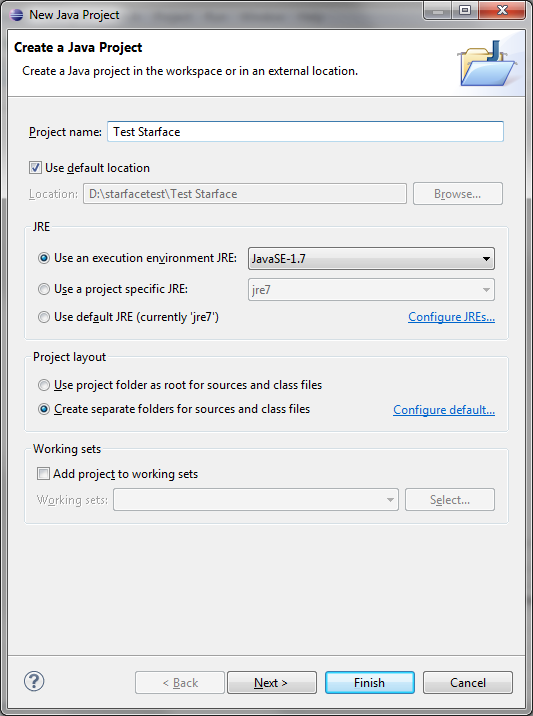 Create a new Java Project for your Tests in your Eclipse IDE. 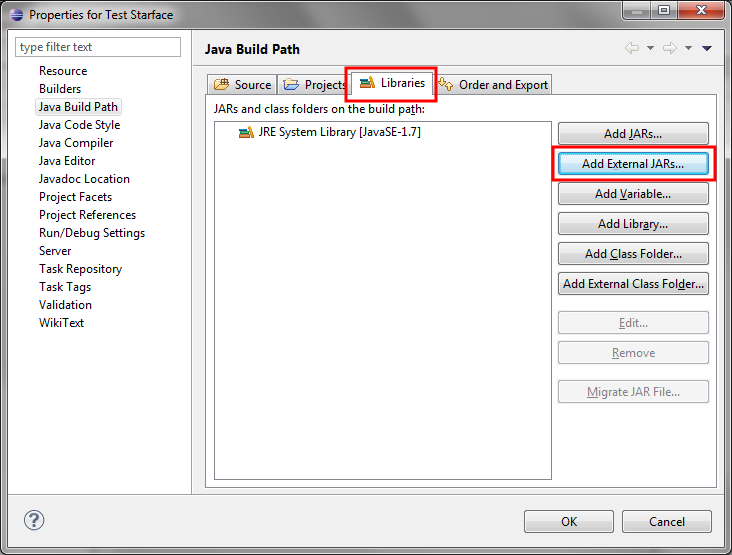 Right click your new Java project and select "Build path->Configure Build Path..."
In the Build Path Configuration select the "Libraries" Tab and click the "Add External JARs..." Pushbutton. In the File selection dialog go to the directory where you have expanded the UCI Java API in Step 1 and add all jars in the "starface-uci-proxy-java-2.2.0\lib" folder to your build configuration. 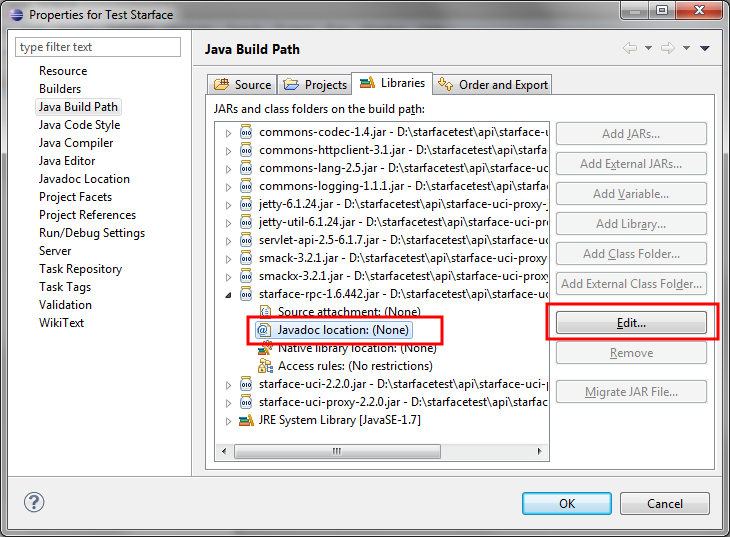 Repeat the same steps to add the "starface-uci-proxy-2.2.0.jar" in the "starface-uci-proxy-java-2.2.0" folder to your build path configuration. 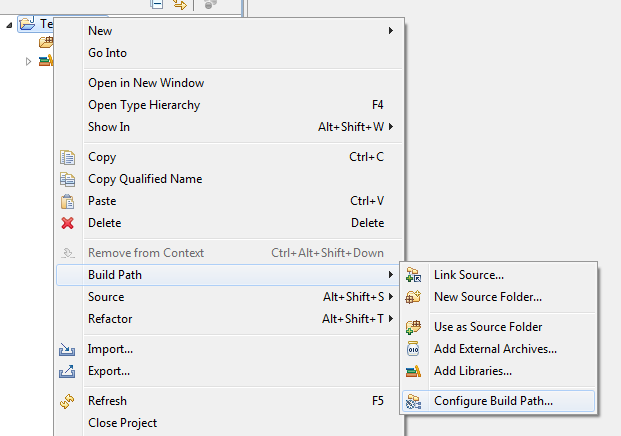 As an optional but very recommended step you can add the javadoc of the API to your build configuration. To do so expand the "starface-rpc. 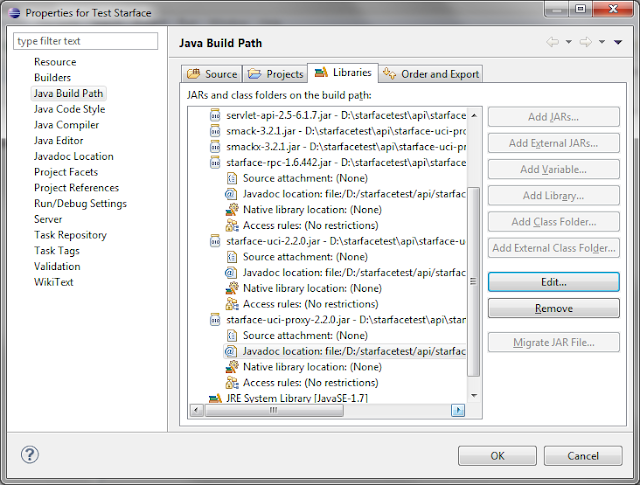 *.jar", click the Javadoc location line and select Edit. 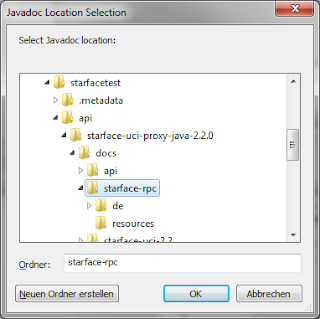 In the following Dialog select "Browse" and browse to the location of the "starface-uci-proxy-java-2.2.0\docs\starface-rpc" folder. Repeat the steps to add the Java doc for starface-uci and starface-uci-proxy too. To test if everything has been configured correctly create a new Java class in your new Java project and paste the following code to the main function. You have to replace "starfacehost" "userID" and "password" with the correct values of your environment. When you run the programm you should see the following status message in the console view. 08:40:06,234 INFO shutdown: RPC server is currently not running. 08:40:06,297 INFO onConnectionEstablished: Connection to UCP server successfully initialized. 08:40:06,297 DEBUG startReconnectTimer: Activating reconnect timer. 08:40:06,297 DEBUG resubscribeAllEvents: Finished resubscribing events. 08:40:06,297 DEBUG stopReconnectTimer: Deactivating reconnect timer. 08:40:06,407 DEBUG shutdown: RPC server shut down. 08:40:06,407 INFO closeTransportAndDetach: Successfully disconected from UCP server. 08:40:06,407 INFO shutdown: RPC server is currently not running. You know that there's already a Starface Plugin for Notes available ... ? Yes i know, but this connector has only a small fraction of the features i have planned for our own implementation of a Notes starface cti client.